If the phrase ‘blind wine tasting’ sends shivers down your spine and conjures up inadequate feelings reminiscent of your SAT test then you haven’t enjoyed a chill NW blind tasting. It doesn’t get more laid back then that. What Burnt Bridge has discovered is that the response to blind tastings is overwhelmingly positive. At their monthly events, they taste four to five of their own wines. At the start of the evening participants are told all the wines being tasted but not the order. It’s up to them to decide which glass holds which award-winning offering. Lenné Estate, in the Willamette Valley, took their blind tasting concept from the days when winemaker/proprietor, Steve Lutz, worked for Mondavi in California. At each scheduled tasting, eight wines are chosen—predominantly from other growers or even growing regions with Lenné wines sprinkled in. Lutz is careful to choose the same vintage in a similar price point to keep things fair. Aside from the fun component, wineries and wine bars that preside over blind tastings do it for the unique educational experience. Courtney Barker of Vancouver’s Veraison Wine & Events describes it as an extension of their desire to help the consumer have a better understanding of what their palate leans toward. At the end of every tasting, Barker asks each customer what they preferred about the featured wines in order to help them make better choices when purchasing bottles based on what they discovered from the experience. Stuart added that, without knowing what a person is tasting, it starts a discussion within the group about style, acidity, oak, tannin, body and all the other nuances that make wine so interesting and distinct. “You not only learn what you like, but you learn why you like it and life is too short to drink wine you don’t like,” Stuart said. 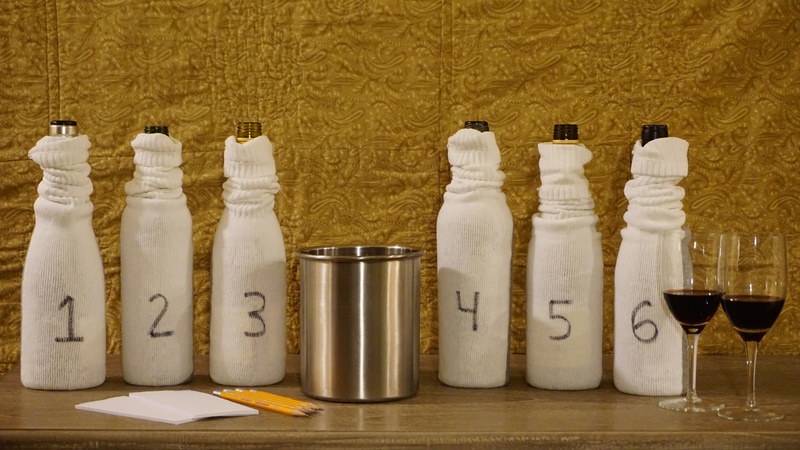 Once participants have some basics down, blind tasting can become as layered as the wine itself. Lenné Estate finds their Red and Black seminar particularly educational. This is where they taste wines from volcanic soils versus sedimentary soils. Handouts are given for this one to walk attendees through aroma and flavor characteristics they might encounter in wines grown in these soils. Ultimately, blind tastings are another approach to experiencing wine. “It gives you something to do when tasting wine. You can talk about the wine a little bit but it doesn’t have to be serious at all,” Barker said. **Follow Corks & Forks by clicking the ‘Follow’ button or follow Corks & Forks on Facebook, Twitter @WACorksandForks or Instagram Viki@WACorksandForks. I am a Clark County native. I am Level 2 WSET (wine and spirit education trust)-certified and enjoy pairing wine with my passion for travel and fondness of food. My most prized possessions are the memories of places I've been with my husband, the chance encounters we've been blessed to have along the way and my carry-on bag. I can often be seen around town and in tasting rooms with our two beautiful, double-Merle Australian shepherds, Challenge and Baby Girl.